I know I've touched upon this before, but the cover of Pearl Jam’s latest album, Backspacer, was designed by Tom Tomorrow (a.k.a. editorial cartoonist Dan Perkins), who is best known for his liberal slanted weekly comic strip This Modern World. 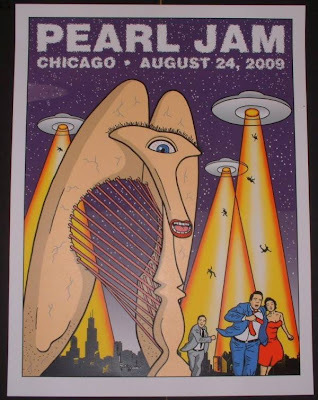 Needless to say, The Blot was really excited to find out Tom had also designed a concert poster for the band’s August 24, 2009 show at the United Center in Chicago, IL. As far as I am aware, this is the first time an artist has designed the artwork for a Pearl Jam album and a concert poster for that album’s corresponding tour. I love Tomorrow’s art style, and may or may not now be the proud owner of a signed and numbered AP print of the poster below. 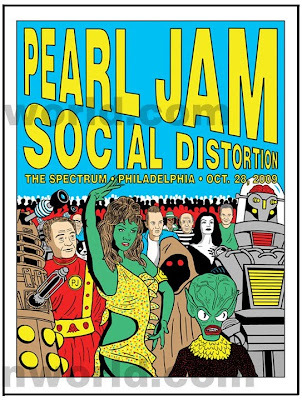 While I love Tom’s ode to Chicago, the real reason I’m writing this post is because of the amazing Halloween themed concert poster set he designed for Pearl Jam’s four night stay at Philadelphia’s The Spectrum. 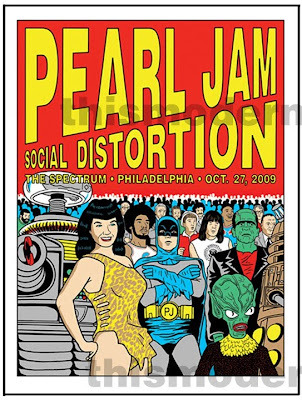 If you haven’t heard already, The Spectrum closed for good after Pearl Jam’s final show there on Halloween 2009. Pearl Jam played four shows at The Spectrum, October 27th, 28th, 30th and 31st, and played almost every song the band has ever recorded. 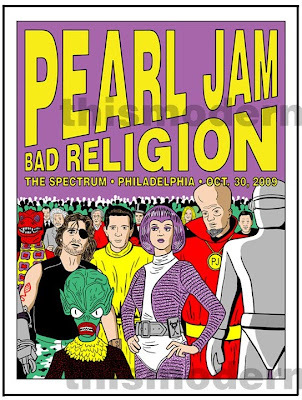 To go along with Pearl Jam’s four shows in Philly, Tomorrow designed four posters (1 for each night) that could stand alone individually or, when placed next to each other, form one giant retro pop culture costume party themed image. 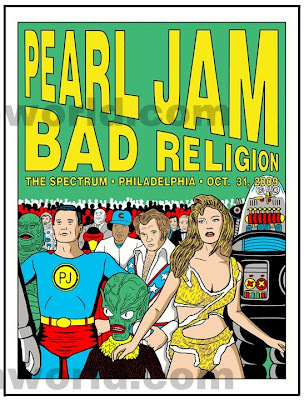 If you are interested in purchasing these awesome Halloween inspired Pearl Jam concert posters, Tom Tomorrow will most likely be selling a signed and numbered edition of these sometime early next year, around February or so. They’ll be available as complete sets of four only, and an exact price has not yet been set. If you’re interested in a set, Tom’s compiling a waiting list which you can add your name to by sending an email to him at tom(dot)tomorrow (at) gmail (dot) com with “Philly waiting list” in the subject line. Please note, you are not placing an actual order and he is not taking any money at this time. But when he does eventually do the sale, priority will be given to those on the list.